Sri Padmavathi Women's University #PGCET 2018 Hall Tickets: Sri Padmavathi Mahila Vishwavidyalayam, A state Government Women's University, Tirupati issued the Post Graduate Common Entrance Test Notification (#SPMVVPGCET) 2018 on March 21, 2018. SPMVV Officials invited the applications from all the eligible women candidates who have passed /appeared for the final year examination in the qualifying degree for admission into Post Graduate courses offered by Sri Padmavati Mahila Visvavidyalayam, (Women’s University), Tirupati through SPMVVPGCET 2018. Eligible students were applied for this entrance test through online mode from 25-03-2018 to 05-05-2018 and applied candidates are waiting for their hall tickets for attending the entrance exam, which will be held in May-2018. University officials will send these hall tickets to applied candidate's address or candidates can download their hall tickets from university web portal. 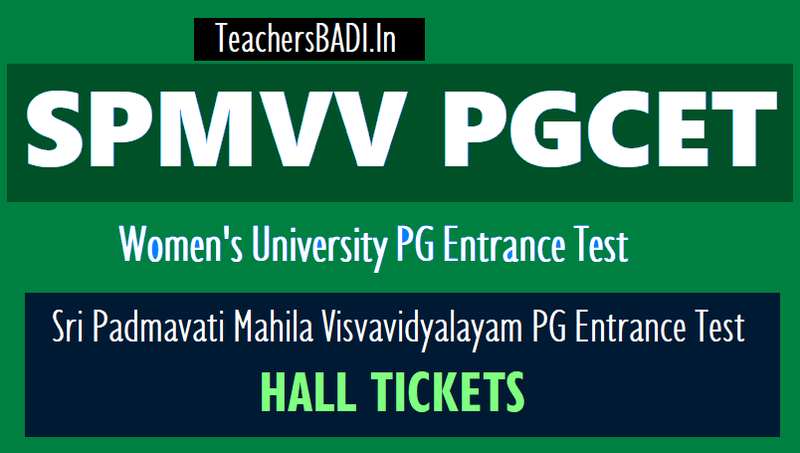 SPMVVPGCET-2018 hall ticket is to be preserved carefully and produced at the time of admission.